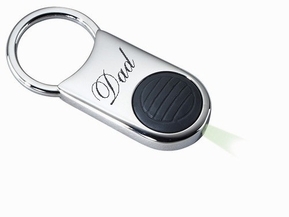 This engraved silver flashlight keychain can be engraved on both sides. The front can be personalized above the flashlight button. This custom keychain is very practical when searching for the car's key hole or dropped items, especially at night time. Dimensions: 1-1/4" x 2-1/2" x 1/4"